The position of the first baseman. 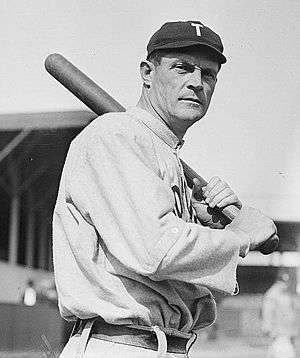 Tim Jordan, first baseman for the Washington Senators (1901). 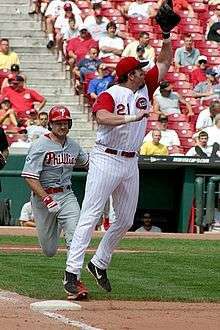 Also called first sacker or cornerman, the first baseman is ideally a tall player who throws left-handed and possesses good flexibility and quick reflexes. Flexibility is needed because the first baseman receives throws from the other infielders, the catcher and the pitcher after they have fielded ground balls. In order for the runner to be called out, the first baseman must be able to stretch towards the throw and catch it before the runner reaches first base. First base is often referred to as "the other hot corner"—the "hot corner" being third base—and therefore, like the third baseman, he must have quick reflexes to field the hardest hit balls down the foul line, mainly by left-handed pull hitters and right-handed hitters hitting to the opposite field. They usually are power hitters that are in the top of the league in Home Runs and extra base hits while maintaining a .270 plus batting average. The nature of play at first base often requires first basemen to stay close to the bag to hold runners or to reach the bag before the batter. First basemen are not typically expected to have the range required of a third baseman, shortstop, second baseman or an outfielder. As a result, first base is not usually perceived to be as physically demanding as other positions. However, it can also be a very hard position to play; a large amount of concentration and timing is required. Though many play at first base their entire career, it is common for veteran players to be moved to first base in order to extend their careers or to accommodate other recently acquired players. Facing a possible trade or a considerable reduction in playing time, a player will usually opt to move to first base instead. Catchers and corner outfielders are often moved to first base due to deteriorating health or if their fielding abilities at their original position are detrimental to the team. When first base is not occupied by a baserunner, the first baseman usually stands behind first base and off the foul line. The distance he plays from the base and foul line is dependent on the current hitter and any runners on base. The exact position may also depend on the first baseman's experience, preference, fielding ability. For a known right-handed pull hitter, the first baseman might position himself further towards the second baseman's normal fielding position. For a known left-handed pull hitter, the first baseman will position himself closer to the foul line in order to stop a ball hit down the line. To protect against a bunt on the first base side of the infield, the first baseman will position himself in front of the base and move towards the hitter as the pitch is thrown. As soon as the pitcher commits to throwing towards home plate, the first basemen will charge towards the hitter to field the bunt. 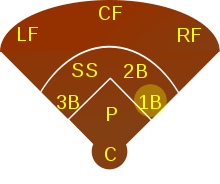 During these plays, it is the responsibility of the second basemen to cover first base. The first baseman is usually at the end of a double play, though he can be at the beginning and end of a double play. Unusual double plays involving the first baseman include the 3–6–3, 3–4–3, 3–2–3, or a 3–6–1 double play. In a 3–6–3 or 3–4–3 double play, the first baseman fields the ball, throws to second, where the shortstop (6) or second baseman (4) catches the ball to make the first out and then throws back to the first baseman who reaches first base in time to tag first base before the batter reaches first base. For a 3–2–3 double play, the bases must be loaded for the force-out at home plate or the catcher must tag the runner coming from third base out. With a force-out at home plate, the first baseman fields the ball, throws to the catcher, the catcher steps on home plate for the first out, then he throws it back to the first baseman to complete the double play. The 3–2–3 double play with a tag out at home plate is usually not attempted because of the possibility of the catcher not being able to tag the runner and/or block the plate. 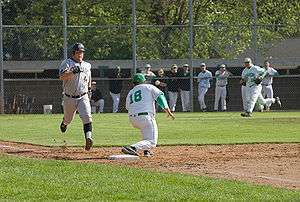 If the runner at third base is known as a good or fast baserunner, the first basemen will make considerable effort to make sure the third base runner does not advance to home plate for a run by "looking" him back to third base. The primary goal of the first baseman in this instance is to ensure the runner doesn't advance and that the team records at least one out, especially in a close game. A 3-6-1 double play is almost like a 3-6-3 or a 3-4-3 double play, but the first baseman is usually playing deep in the infield. Here, the first baseman throws the ball to the shortstop covering second, but the pitcher then has the responsibility of covering first base to receive the throw from the shortstop. The same advantages of being a right-handed throwing catcher, third basemen, shortstop or second basemen apply to the left-handed first baseman. These advantages surface in plays where the player is required to throw to another infielder after fielding a batted ball. In these instances, a right-hander will be required to turn more towards their target before throwing whereas a left-hander will usually already be positioned to make a throw. However, compared to the advantage for the right-handed throwing third baseman, shortstop, or second baseman, these advantages for the left-handed first baseman are minor because many balls hit to the first baseman are to his right, so that a right-handed first baseman fielding them backhanded does not need to turn after fielding a batted ball in order to throw it. In addition, a majority of plays only require the first baseman to receive a throw, not to field or throw himself. This is attributed to the overall majority of baseball players batting right-handed, and therefore, a majority of batted balls are hit to the left side of the infield and fielded by the third baseman or shortstop. Left-handed first baseman are also advantageous in attempting to pick off baserunners at first, as the left-hander can catch and tag in one motion, often doing both at the same time, while right-handed first baseman must sweep their glove across their body, costing them a crucial fraction of a second in applying the tag. 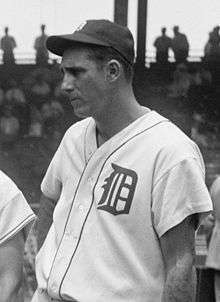 Hank Greenberg, Hall of Famer and 2-time MVP. The second-most-difficult play for a first baseman is the "tag play". Whenever an infielder's throw is so far off the mark that the first baseman must abandon his base in order to catch it, the first baseman is left with only two options. In order to put the runner out, he must either lunge back to the base before the runner reaches it, or he must tag the runner before the runner reaches the base. A tag involves touching the runner with the ball (or with the gloved hand holding the ball) before the runner reaches the base. At first base, the typical tag play occurs when the infielder's throw is high and to the left of the first baseman, causing him to jump and stretch his long mitt to catch the ball before it sails into the dugout or the grandstand. The tag is made, after the catch, by swiping the mitt downward, toward the in-coming runner's head or shoulder, often in one fluid motion that is integrated with the act of catching the ball. Performed properly, the tag play can be spectacular to see. Bill James sees the role of first baseman on a continuum of defensive talent: aside from pitchers and catchers, difficulty of playing the position ranges in declining requirements from shortstop to first base as shortstop, second base, center field, third base, and left or right field (depending upon the ballpark), and first base. Anyone who can play another position on the field can play first base. At or near the ends of their careers, good hitters are often moved to first base as their speed and throwing arms deteriorate, or their teams become concerned with the likelihood of injury. Such players include Hall of Famers Johnny Bench (originally a catcher), George Brett (third baseman), Ernie Banks (shortstop), Rod Carew (second baseman), Al Kaline (right fielder), Mickey Mantle (center fielder), Mike Piazza (catcher), and Mike Schmidt (third baseman).